I've always been a fan of caramel and when I had the chance to visit Savannah a couple years ago with my in-laws, I was hooked on southern pralines! 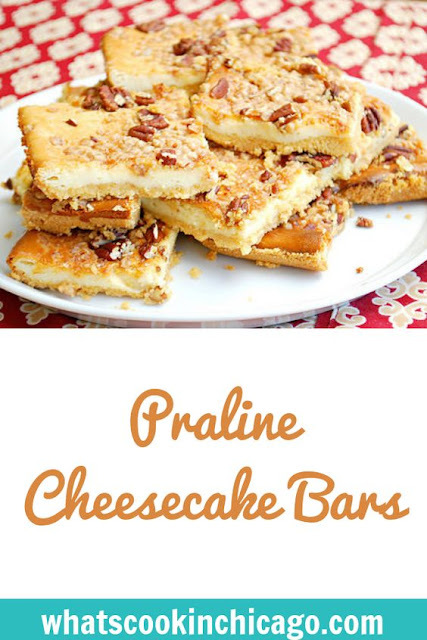 These Praline Cheesecake Bars is a nod to our first extended family trip together, which were perfect for celebrating Mardi Gras earlier this month. A shortbread cookie crust is baked with a creamy cheesecake layer on top that's sprinkled with pecans, toffee bits and more butter shortbread crumbs... was a delicious way to do Mardi Gras proud! My friends at Walkers Shortbread were so kind to send me a couple packages of their buttery shortbread and aside from enjoying them straight out of the box, they are wonderful as a baking ingredient too. I used them to create the shortbread cookie crust and because of their subtle sweetness, it didn't need any additional sugar. As the base of the cheesecake bars, they held up really well to the creamy cheesecake filling too without getting soggy. This recipe is great because it can also serve as a nice base recipe where you can add your choice of toppings, extracts and really get creative. 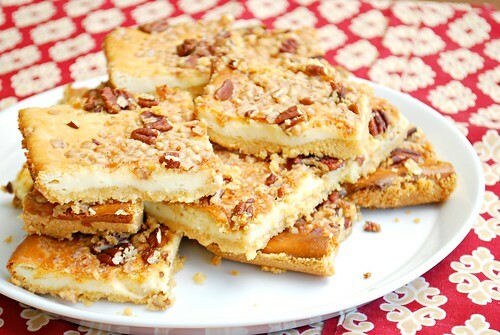 What other cheesecake bar ideas do you have to top a buttery shortbread cookie crust?! Heat oven to 350 degrees. Lightly coat the bottom and sides of a 13x9 inch baking pan. Place shortbread into a food processor and process into fine crumbs. Transfer crumbs into a bowl and add melted butter; stir to incorporate. Reserve 1/4 cup of the cookie crumb mixture and transfer the rest to the bottom of the prepared pan and press down to form crust. Bake in preheated oven for 5 minutes. Meanwhile, prepare the filling by combining filling ingredients into a large bowl. Using an electric hand mixer, beat until smooth on medium speed. Transfer filling mixture over the partially baked cookie crust and spread evenly. Sprinkle with reserved cookie crumb mixture, chopped pecans and toffee bits. Return pan to the oven and continue baking for 35-40 minutes or until light golden brown. Remove from oven and cool in pan for at least 30 minutes. Chill pan in refrigerator for at least 2 hours or until completely cooled.